The RDA organises dressage competitions to suit people at all levels and with all types of disability. Many disabled people get involved in riding through the RDA for therapeutic reasons. It gives mobility, independence and enjoyment to people who may otherwise have difficulties in getting around and being active. RDA dressage test range from very simple tests in walk only, allowing a helper to lead the horse, right up to tests equivalent to Elementary level. The RDA holds a National Dressage Championships annually with qualifiers taking place all around the UK. Contact your local group or Kay Woodcock at RDA HQ for more information (tel 0845 658 1082). FEI Para Equestrian is the governing body for international competitions for disabled riders. Dressage competitions for riders with disabilities started in Scandinavia and in Great Britain in the 1970s. In 1987 the first dressage World Championship was held in Sweden, and riders first took part in the Paralympic Games in 1996. Para Equestrian Driving is a World Championship Sport. In 1991, the International Paralympic Committee (IPC) appointed IPEC (the International Paralympic Equestrian Committee) to run competitions and develop the sport all over the world. This has been done very successfully, and in 2005 there were some 38 nations in five continents competing. From January 2006, IPEC has joined the FEI as Para Equestrian, their 8th discipline, moving governance from a general sports organisation (IPC) to one specialising in equestrian sport (FEI). Carriage driving competitions are also run under Para Equestrian (IPEC) rules and show jumping competitions are in the process of being introduced. Riders are graded I-IV according to their disability, with Grade I riders being most disabled. Tests for Grade I and II riders include walk and trot only, and Grades III and IV are expected to canter and perform more difficult moves. Learn more about the classification of rider disabilities. Once a rider has been internationally classified they receive an FEI Para Equestrian International Classification Identity Card (IPEC ID Card) describing their profile number, Grade and a list of compensating aids they are allowed to use in competition. Compensating aids may include but are not limited to: use of the voice; whip(s), rein and saddle adaptations; bands to hold feet in the stirrups. For example, I'm allowed to use special split reins when riding in a double bridle because I find fine movements with my fingers difficult and I can't hold two reins. I'm also experimenting with some loop reins which are good for when I ride Indi as he can sometimes be strong in the hand and the reins slip through my fingers. These reins help me keep a steady contact. More information on the De Boiz Correct Contact Reins. The majority of international IPEC competitions are 'own horse' competitions where you travel abroad with your own horse (like when I went to Holland and Ireland). Previously, all competitions were 'borrowed horse' competitions where you were allocated with a horse provided by the host country (like when I went to Spain). Sometimes you may need to borrow a horse at an international 'own horse' competition if it's impossible to bring your own horse, but you will be competing against riders who are on their own horses. Imagine asking just about any able-bodied rider to compete in an international competition, only having ridden their mount for a matter of hours before the event, most would run a mile! If you're a Grade III or Grade IV rider, you are the only person allowed to ride your horse at a competition, so it's up to you to make it work! This can be hard if the rider tires easily or has a difficult horse which takes time to settle. Your trainer can lunge the horse for you to get rid of excess energy but all the schooling during the competition is the responsibility of the rider. From January 2007 onwards, you and your horse will need to be registered with the FEI in order to compete internationally. Horses and riders not registered will not be allowed to enter an FEI Event. Registration for British riders is administered through the BEF. Click here or contact the BEF for further information. Click here to view all the current dressage test for Para Equestrian competitions. Some of the tests have changed their names slightly since 2005 so it's worth familiarising yourself with the tests for your grade. You can also download the individual tests from the IPEC Athletes website. View the FEI Generic Rules for Para Equestrian (PE) and the Rules for FEI PE Dressage competitions. Applications for Government and Lottery funding are made by the BEF on behalf of the Olympic Sporting Member Bodies. Since April 2002 all three phases of World Class Start, Potential and Performance have been up and running. This three stage, long term plan to identify and develop outstanding talent in the equestrian sports of Dressage, Paralympic Dressage, Eventing and Show Jumping, is based on a template that has been outstandingly successful for other Olympic sports and qualifies for Lottery funding through UK Sport and Sport England. The World Class Start and Potential Programme was established in 2002 with Lottery funding through Sport England to identify talent from a young age and develop a pathway for riders between the ages of 14 and 30 (approx) who demonstrate the talent and dedication to ride and win at Olympic level in the four equestrian disciplines – Dressage, Paralympic Dressage, Show Jumping and Eventing and for these riders to progress onto the Olympic Performance squads in 2008 and 2012. The World Class Development programme offers support for further training and enables riders to gain international competition experience. World Class Start riders are aged between 14-20 (approx) and World Class Potential riders are aged 20-30 (approx). To be part of the World Class Start & Potential programme all riders must go through a selection process. Riders on World Class Performance are the elite riders who will be most likely to be selected to represent Great Britain at the Paralympics. The current World Class Development Selection Policy Document can be viewed here. This will give you an idea of the minimum level of competitive experience required to qualify for selection and also includes the selection dates. The application process opens on the 18th July 2008 and application forms will be available to download from the BEF website. For more information on joining the start or potential programmes, visit the BEF website or contact World Class Start and Potential Manager Victoria Underwood - Tel: 02476 698876. Selection Trials are usually advertised in Horse and Hound and through the RDA, BHS and Pony Clubs. As mentioned above, you and your horse will need to be registered with the FEI if you want to compete internationally. Registration for British riders is administered through the BEF. Click here or contact the BEF for further information. 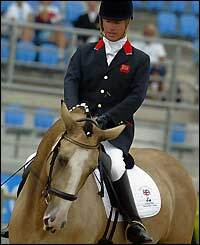 British Dressage (BD) is the governing body for the majority of able-bodied dressage competitions in the UK . To compete in BD competitions you must be riding a horse or pony that is registered with BD and you must be a member (or buy 'tickets' which allow you to ride as a guest member). The good thing about BD events is that the organisers have to follow the BD rules, and the judges have to be trained and listed on the BD Judges List. This means that, in general, these competitions are well run and have good facilities, and the judges are knowledgeable, fair and consistent. In BD competitions you gain points for every score over 60% and you gradually work your way up the grades from Novice upwards as you and your horse become more experienced. You need to be a member of British Dressage to compete in these competitions on a regular basis and your horse will need to be registered with BD. However, when you are first starting out there are ways in which you can try out BD competitions before joining. You don’t need to be a BD member to enter preliminary classes at affiliated dressage competitions so you can start with these classes. Alternatively, you can try BD competitions through the class ticket system. By buying a class ticket for £6, you can enter one BD class without being a member or having a registered horse. You can use a maximum of six tickets per year and win rosettes and prize money, but will not receive BD points or qualify for Championships, except Area Festivals. As a disabled rider competing under BD rules, you may need to have a dispensation certificate, which is a signed form from BD that states certain allowances that can be made in order for you to compete on level terms with able-bodied riders. For example, if you need compensating aids such as the adapted reins I use, you can get permission to use them in BD competitions. Other riders may ride with one hand, for example, or without stirrups because of their physical disabilities. Without a dispensation certificate, a BD judge would be within their rights to deduct marks if you did not comply with BD rules, although as more and more disabled riders compete in BD competitions, judges are becoming more understanding and knowledgeable. British Dressage also organises UK dressage competitions specifically for Para Equestrian dressage riders. There is now usually a Winter Para Trial series and then a Summer series, both culminating in a Championship show for which riders qualify. See the competition page for details of this year's competitions. The Para Trial competitions are used to select the squad and ultimately the team that will represent GB in international competitions. You can also compete internationally as an individual if you are not selected for the team. 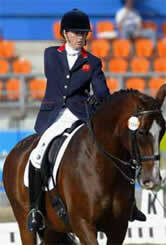 To do this, you will need to apply for permission to Sarah Murphy at British Dressage. You also need to make sure that you and your horse are registered with the FEI and your horse will need an FEI passport. For most Para Equestrian competitions in the UK, you also need to be a member of BD, but not necessarily if you are competing in the Restricted section. BD also organises Talent Spotting days to identify talented riders new to the sport of dressage or para dressage. These usually take place in February. These are competitions that use BD tests and generally follow BD rules, but the organisers are not part of the BD scheme, so you won't receive points. These events are slightly more low key than affiliated events and are a good place to start. These events are ideal for novice riders, or for more experienced riders who want to introduce a young horse to competitions. The Pony Club and British Riding Clubs run unaffiliated competitions for their members. They use a combination of BD tests and their own tests tailored towards encouraging people to 'have a go'. This is a great place for getting started, and most clubs organise training sessions at very reasonable prices, as well as running competitions for both individuals and teams.